Money flows across borders much easier than goods or people. The financial markets are an interconnected system, and a hedge fund manager in London can purchase financial assets in Hong Kong with just a few easy key strokes. Investors solely focused on what is happening within their own borders will be blindsided by the impact of the surrounding world. The following chart provides an excellent visual of the monthly dosage of QE provided by the "Big 4" central banks; the Federal Reserve (Fed), the European Central Bank (ECB), the Bank of England (BoE) and the Bank of Japan (BoJ). You can see they are now printing more money monthly ($180 billion) than at any time since the financial crisis began in the summer of 2007. 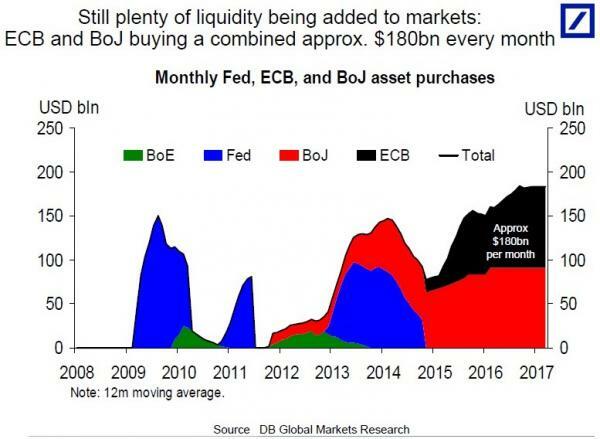 While the Fed (blue) carried the load for the world from 2009 to late 2014, the baton was passed to the ECB (black) and the Bank of Japan (red) to continue to prime the liquidity gusher. This chart does not include China where credit and money growth has taken on Biblical proportions. What happens when money is printed and pumped like a fire hydrant into the financial system? It sloshes around the world violently. This is why you see liquidity flooding into the real estate markets of major cities in Australia, Canada and the United States. You see liquidity flooding into stocks, bonds, commercial real estate and fine art. The high end car market is booming. The world is completely drunk on free money, low interest rates and unlimited debt growth. The hangover and consequences, when the music finally stops, will be catastrophic. The real global economy had a heart attack in the fall of 2008, was never given an opportunity to heal and has been living on life support since. 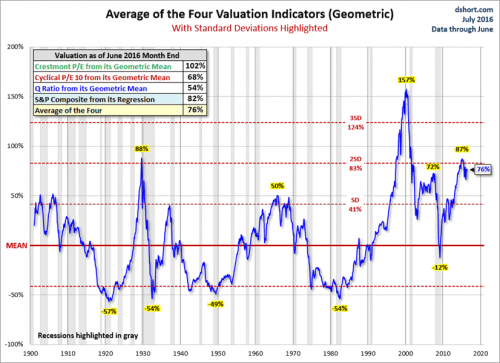 At some point artificial asset prices will peak, turn lower and then collapse back to the level the real economy can support. Until then, we'll see how creative the central banks can get in order to keep everyone at the party drinking as much as possible.